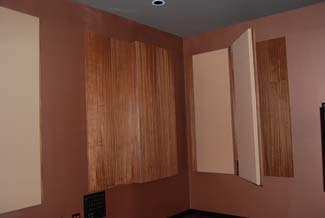 Wedges, Baffles and Diffusers are just a sample of choices that reduce overall noise and control reverberation by trapping and dissipating sound waves. These materials vary in thickness and in shape to achieve different absorption ratings depending on the specific sound requirements. In audio, diffusion is caused by sound waves reflecting off many complex surfaces. Diffusion is described as the process of spreading or dispersing radiated energy so that it is less direct or coherent. For instance, the plastic cover over a fluorescent light acts as a diffuser. These covers make the light spread out in a more randomized way so it is less harsh. The same principal applies to sound. Diffusion is an excellent alternative or complement to sound absorption because it doesn't really remove much energy, which means it can be used to effectively reduce reflections while still leaving an ambient or live sounding space. The multiple facets and angles of the diffusers redirect and redistribute sound waves throughout the room, helping to eliminate hot-spots and dead-spots while maintaining a true "live" sound. 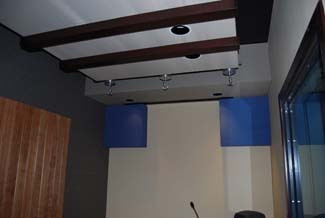 TechStar Industries offers a number of different sound diffusers to fit every design and every budget. We offer the barrel and pyramid diffusers (the standards in the recording industry) and a more economical line of thermoplastic molded diffusers. To achieve free-field conditions within an acoustic test environment for the measurement of radiated sound power and directivity, the testing area must be free from reverberation, feedback and resonance throughout the audible frequency spectrum. Wedges, cut in a variety of sizes and shapes, are effective materials for use in anechoic and hemi-anechoic chambers. 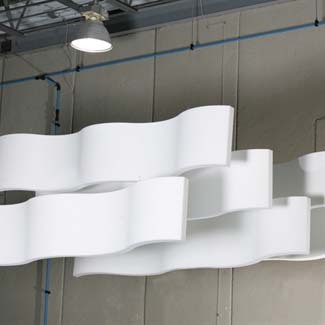 The acoustical wedges absorb the kinetic energy created by the sound waves. At the same time, the large surface formed by the wedges increases the total absorptive area to absorb even the long wavelengths of low frequency sound. We work with you to determine the optimal acoustic solutions to meet your precise testing and benchmarking in the aerospace, automotive, electronics, research, government and hard goods manufacturing industries. 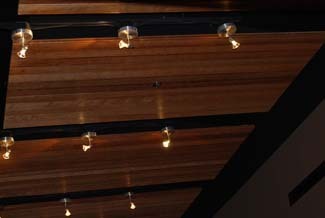 Baffles and Clouds are vertical or horizontal acoustical panels hung from the ceiling that significantly reduce reflected noise in large, open rooms where sound reflects off of hard surfaces such as walls, ceilings, glass windows, even floors and tables. They can dramatically improve not only the acoustics, but the aesthetic presentation of large rooms. TechStar Industries offers a complete line of sound absorbing solutions to treat any space and are suitable for industrial, commercial and institutional applications where reflected noise interferes with speech intelligibility and sound levels. Both baffles and clouds are pre-assembled to your specifications. Graphics can be incorporated to establish themes or as stand-alone designs. We offer a wide variety of styles, construction materials, sizes, textures and colors to meet just about any desired performance, budget and interior design. Most styles meet ASTM-E84 Class I fire ratings and achieve high-sound absorption ratings of NRC .80 – 1.05. 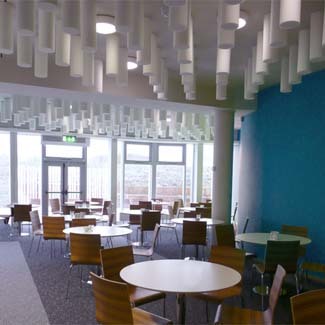 They can be easily and quickly installed providing a low cost acoustical solution.